Turnover Requirements Deposit and Winnings from Bonus Bets must be turned over twice at odds of 1.80+ for sports and 1.50+ for racing prior to withdrawal. Yes, the website is oldschool, but so is the service. In a very positive way! One of the newer kids on the block, ClassicBet refer to themselves as Australia’s first premium betting agency. ClassicBet has found a niche in the Aussie market for higher stakes bettors. This betting company is 100% Australian owned and they cover horse, greyhound and harness racing as well as all of Australia’s favourite sports (AFL, NRL, Cricket, Tennis, Soccer). Every member of ClassicBet gets their own personal account manager. If you are considering opening an account with ClassicBet you are in the right place, as you will find all the information you require in our extensive and exclusive ClassicBet review. Every client gets their own account manager. 100% Aussie owned, ClassicBet was formed in 2014 and branded itself as Australia’s first premium betting agency. They adopt a different approach to other bookies, and every customer gets their own personal account manager. ClassicBet is licensed in New South Wales and that is where their headquarters are based too, at Penrith Paceway. ClassicBet concentrate exclusively on racing and sports, so if you are someone who bets on politics or entertainment then this may not be the bookmaker for you. They cover a wide range of sports, including AFL, tennis, basketball, soccer, golf, rugby and lots more. The depth of markets available is more than decent too, on both domestic and international events. ClassicBet also have a solid mobile/web app, so when it comes to betting on the move they have all the bases covered! 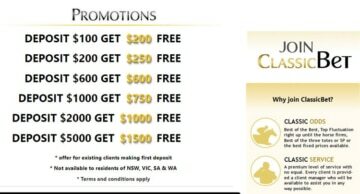 The vast majority of Aussie bookmakers try to lure customers in with a sizeable sign up bonus. ClassicBet are no exception, and their sign up bonus is one of the best in the business. When you open an account with ClassicBet, you can choose whichever bonus suits your budget best. The minimum deposit is $100, and for this you will receive a $200 bonus bet. The bigger your first deposit, the bigger your sign up bonus. The maximum bonus earnable is $1500, and to receive this your first deposit must be $5000. To find out exactly how to get your ClassicBet sign-up bonus, read below. Open up your new ClassicBet account by following the link. Make a first deposit of minimum $100. Your account will instantly be credited with $200 in bonus bets. For bigger deposits you get a bigger bonus. Deposit/Bonus Levels: $100/$200, $600/$600, $5000/$1500. Bonus bets must be used on horseracing unless otherwise specified. Bonus bet can be broken down into separate minimum wagers of $0.50. Value of bonus and winnings must be turned over X 2 before winnings can be withdrawn. * Other terms and conditions apply see ClassicBet Rules for details. Once a new customer takes the bait and opens a new account with a bookmaker, promotions are used to keep them hooked. ClassicBet run a number of useful promotions for existing customers, mostly geared towards horse racing. They also run an excellent Rewards scheme for members! In general, ClassicBet takes good care of its members, and we have absolutely no arguments to prove otherwise. After all, ClassicBet offers a premium betting experience! At this present time, it is illegal for Aussie betting companies to offer live betting online. This is due to the Interactive Gambling Act which was passed by the Aussie Government in 2001. However, with ClassicBet you can still bet in play by just picking up the phone and dialling 1800 888 001. Just let the operator know what bet you want to place and they will tell you the odds. Minimum stake for telephone bets is $10. A lot of Aussie bookies are now offering live streaming of certain horse racing meetings and sporting events. Unfortunately, at this present moment ClassicBet do not offer live streaming on any events. This situation may change it the future, and if it does you will find out straight away here at Aussiebet. 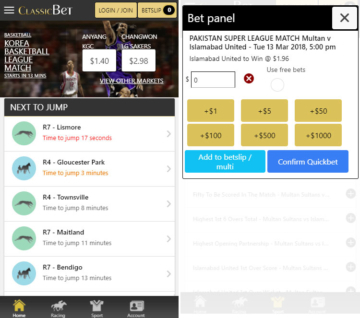 The fact that ClassicBet market themselves as a ‘Premium Bookie’ is reflected in their mobile and web apps. Betting on the move is increasing in popularity at an astonishing rate in Australia. With ClassicBet you can bet on the go with consummate ease. If you use an iPhone/iPad, an Android device or Windows Phone, Blackberry or Nokia, ClassicBet caters to your needs. The iPhone/iPad/iPod Touch app is available to download free from the App Store. The app is 12.1mb in size, it requires IOS 8.0 or later and age restrictions apply. The Android App is available to download via a link on the ClassicBet site, just visit on your device, click on the link and start betting. For users of other devices like Windows Phone, Nokia or Blackberry you can bet on the move via the ClassicBet Web App. The App itself is well designed and easy to navigate. 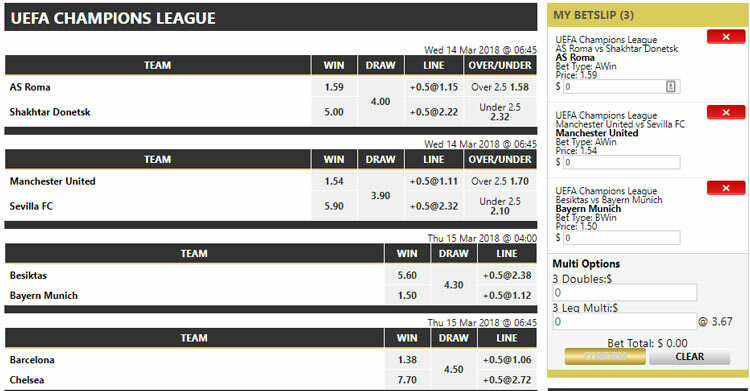 All the usual sports and racing markets can be found, and the odds refresh regularly. The site works very smoothly, and it is simple to place single and multi-bets. In this day and age, it is imperative that betting agencies offer an App that works well and ClassicBet’s Mobile and Web App is definitely worth checking out. How Good Are ClassicBet Odds? When it comes odds and markets available, ClassicBet has room to improve in both these areas. We compared the prices from a trio of bookies for the recent Premier League contest between Manchester United and Liverpool at Old Trafford. What we found was quite revealing and not good news for ClassicBet. For the above mentioned match, ClassicBet had an over round of 107.7% on the home/draw/away market. Bet365 had an over round of 106.93, not a huge difference. However, Unibet had an over round of 104.9% for the same match, a very significant discrepancy of just under 3% with ClassicBet. Unibet also led the way when it came to quantity of markets with 208. 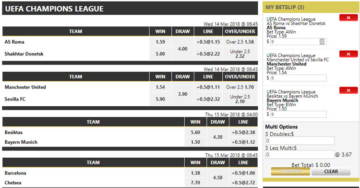 Bet365 had 72, while ClassicBet came in with a respectable 116 total markets. The odds on offer from ClassicBet aren’t terrible, but they could definitely be a bit better. At least they make up for it with the range of markets available. Most Aussie bookies have embraced the Cash Out facility, a tool that allows punters to cash in a bet (single or multi) before the event has concluded. However, at the time of writing ClassicBet offer no such facility. This is a big disappointment, and if in the future ClassicBet do decide to start providing a cash out service we will update this review to let you know. ClassicBet is a betting company that has a superb horse racing betting service. Whether it is a small non metropolitan meeting, or a massive race like The Melbourne Cup, you can get your bet on with ClassicBet. They offer fixed odds and tote betting on racing, including simple bets like win. Place or each way. You can also do all sorts of exotics and multis with ClassicBet, including exactas, trifectas, quaddies, quinellas and first four wagers (flexi betting available). As we outlined earlier in this ClassicBet review you can also take ‘Best Of The Best’ or ‘Best Of 3 + SP’ when you are betting on horse racing with ClassicBet. There are a couple of negatives though. Firstly, fixed odds are not available until a lot later than a lot of their industry rivals. Secondly, the fixed odds on offer are only average when compared to their competitors. However, the positives far outweigh the negatives, and ClassicBet is well worth a try for those interested in betting on horse racing. Thoroughbred Racing: $101.00 (win and place). Quinella: $5k. Exacta: $10k. Trifecta: $20k. First Four: $20k. Quaddie: $50k. *Please check ClassicBet Terms and as other limits may apply. Instant Deposit Methods: Credit Card, POLi. Non-Instant Deposit Methods: BPAY, Bank EFT, Cheque. Withdrawal Methods: Bank EFT, Credit card. When you are trying to decide which is the most suitable bookmaker for you, banking facilities should always be considered. After all, there isn’t much point in opening an account if you are unable to deposit or withdraw cash from it! ClassicBet lag behind some of their rivals with the range of banking services on offer. They don’t facilitate deposits or withdrawals with Skrill or PayPal, and withdrawals must be made via Bank EFT or credit card (only equal to deposit amount). Before you can do any of this your account must be verified. Find out how to verify your ClassicBet account below. Click here to open a ClassicBet account. ClassicBet uses a ‘Points system’ to verify your account. Proof Of ID can be either emailed [[email protected]] or faxed [(02) 4722 3180 / 1800 888 700]. Another key element to think about when opening a new betting account is customer service. Here at Aussiebet we firmly believe that the customer should always come first, and that should be the case with any business. Customer service should be prompt and polite, and ClassicBet have a decent track record in this department. There are a number of ways you can get in touch with ClassicBet, and we have listed their contact details below. Telephone: 1800 252 779 (Australia) or + 61 295 710 030 (International). Post: PO Box 40, Potts Point, NSW 2011. Is ClassicBet A Bookmaker You Can Trust? All personal details are stored on password protected servers and databases. The use of the latest SSL technology to protect payments. All ClassicBet employees must respect strict confidentiality agreements. 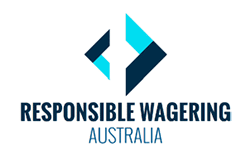 The promotion of responsible gambling is massively important in our opinion here at AussieBet. We like to see the same attitude on display from betting companies, and ClassicBet do a good job. Sometimes gambling can creep up on you, and before you know it you are wagering more than you can afford. Remember, never chase your losses and if the fun stops, then stop! ClassicBet have a number of useful tools and resources to help those affected by problem gambling. Pre-Commitment Limits: Set deposit limits on your account (7 day wait to increase limit). ClassicBet: A Patriotic Choice For Aussies! Overall, ClassicBet has a lot going for it, but on the other hand there are quite a few negatives to think about too. The lack of live streaming, cash out and limited banking facilities are all reasons why punters might think about going elsewhere. However, those issues can be easily improved upon and perhaps ClassicBet might think about that in the future. 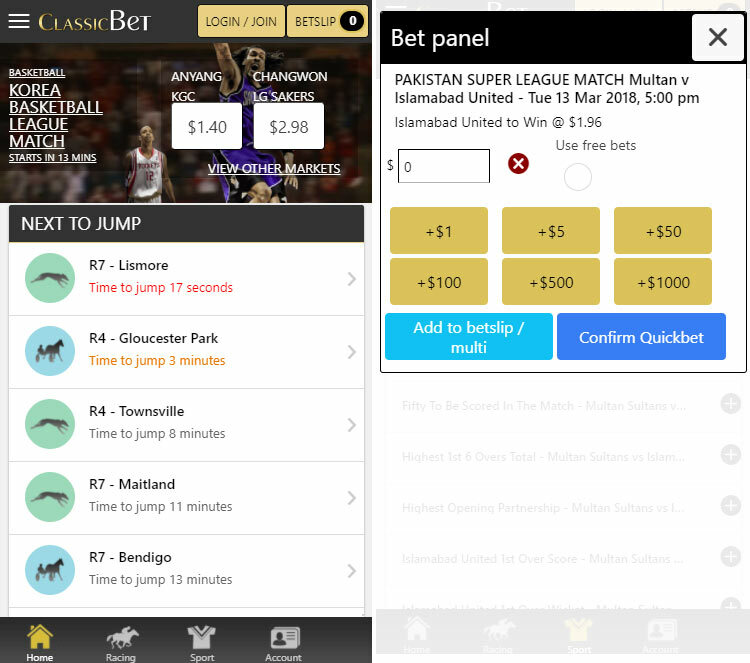 On the other hand, as a new customer, we're sure you will enjoy it a lot, the range of markets available for sports is impressive (especially Aussie Sports) and the ClassicBet Mobile/Web App works like a treat. Best of all, ClassicBet is 100% Aussie owned so for those who are proud to be patriotic punters, ClassicBet could be just the ticket! Classic bet is a complete scam. I urge anyone who is thinking of depositing any money with them to do your research and check their terms and conditions. They will make you turn over your winnings 6 times before being able to withdraw. Do not make the same mistake and get pulled in by their bonus bet scam!